If you think you're just "taking pictures" - think again! Your outstretched piture-taking arm may be putting you at risk! If your forearm takes up more than 10% of your photosyou most likely have SSA and should start using Couplett immediately. If you or or someone you know has experienced SSA, there is now a solution. Couplett uses both cameras simultaneously to maximize your full picture-taking potential and protect your photos from the scourge of "Self Shot Arm" (SSA). 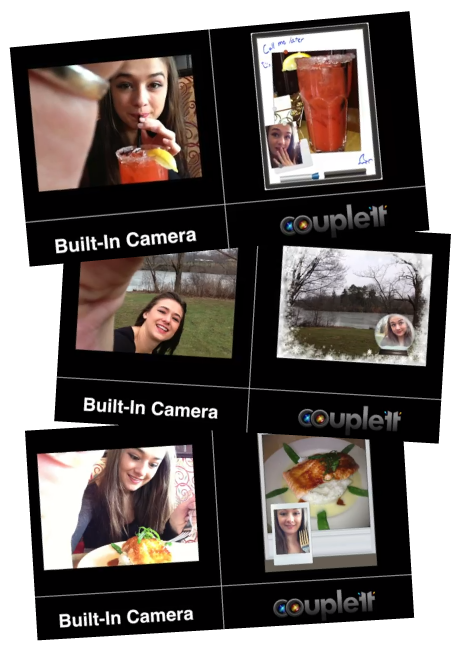 With one tap, Couplett will photograph you and your surroundings then you are free to add a theme and share to Facebook, Twitter or Flickr (and no embarrassing SSA). SSA is probably affecting someone you know! 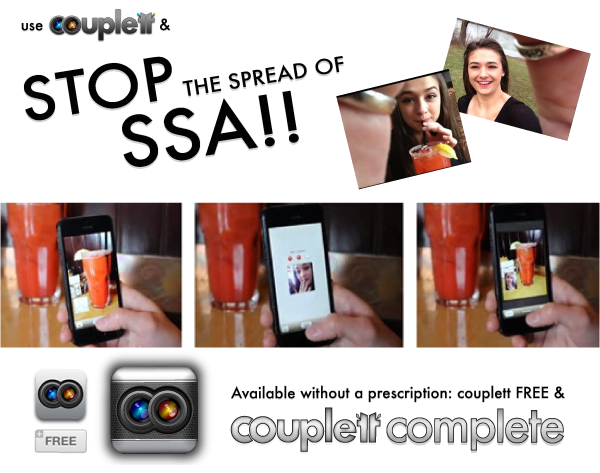 Tell your friends about Couplett and prevent the spread of SSA! For more information on SSA and to learn how to lower your risk please refer to the SSA.PSA. If you have or a friend has experienced SSA visit the App Store and start using Couplett immediately. Want to try before you buy? Get Couplett Free! UPDATE to 2.0 and get the all of the Couplett Complete theme packs for FREE!! So have a little fun on us and thanks for using Couplett to combat SSA. Couplett is made for iPhone, iPad and iPod Touch and when used as directed can significantly reduce the outbreak of Self Shot Arm. There is no cure for SSA. If you find yourself using Couplett for more than 4 hours at once, please put the phone down and read a book.